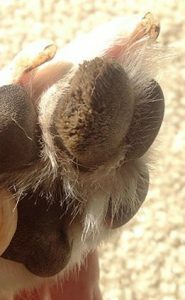 Paw pad hyperkeratosis is a skin condition that is often referred to as “hairy dog feet” because it causes your dog’s paws to look like they are growing an abnormal layer of hair. As silly as that sounds, canine hyperkeratosis can be very painful for your dog and requires immediate attention. Paw pad hyperkeratosis results in thickening of your dog’s paw pads. The same thing can occur to your dog’s nose but is known as nasal hyperkeratosis. There is no known cure but there are things you can do to treat and prevent hyperkeratosis. 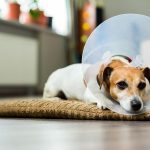 For instance, Paw Soother and Pawtection provide your dog with all natural relief while reducing or eliminating the side effects of paw pad hyperkeratosis. What Causes Paw Pad Hyperkeratosis? This skin condition results when your dog produces too much keratin, often a result of genetics. Certain breeds are most susceptible to canine hyperkeratosis, including Golden Retrievers, Labradors, Dogues de Bordeaux, Bedlington Terriers and Irish Terriers. Leishmaniasis: A parasite often carried by sandflies that can be controlled with medication. Pemphigus Foliaceus: A common autoimmune skin disease that can be diagnosed with a biopsy and treated with immunosuppressive drugs. Zinc Responsive Dermatosis: A skin disease that can occur in dogs that do not properly absorb zinc. This condition is treated with zinc supplements. Canine Distemper: This is rare because most puppies receive a vaccination against Canine Distemper. There is no known cure for canine hyperkeratosis but there are things you can do to reduce the problem and keep your dog comfortable. First and foremost, it’s very important to treat any underlying issue responsible for hyperkeratosis. You’ll need to visit your veterinarian in order to diagnose the underlying problem. In some cases your vet can actually cut away the excess keratin growing on your dog’s paws. Secondly, the goal is to reduce symptoms as much as possible so that your dog remains comfortable. Paw Soother is an all-natural balm that provides soothing relief right after you apply it on your dog’s paw pads. The rich and powerful ingredients go to work healing and moisturizing your dog’s skin, reducing symptoms of paw pad hyperkeratosis. Paw Soother is recommended for more serious cases, while our sister product PawTection is a gentler formula used to maintain smooth and healthy paws after Paw Soother works its magic. PawTection can be used as a first resort for more sensitive dogs or for less serious cases of paw pad hyperkeratosis. See for yourself how the pawesome powers of Paw Soother & PawTection go to work on your dog’s hyperkeratosis! How To Naturally Treat Hyperkeratosis: Why Do Dogs Get Dry, Crusty Noses?